GAINESVILLE, Fla. — After Hurricane Michael left a path of destruction in the Florida Panhandle, members of University of Florida’s youth development program, Florida 4-H, jumped into action doing what it does best: serving the community. Through its dedicated youth members and adult volunteers, 4-H youth in Palm Beach County gathered donations of paper products, hammers, nails, three generators and other supplies to distribute to 4-H families affected by the storm. Youth partnered with Reese Leach of Grace Presbyterian Church in Lantana and Boy Scout Troop 215 led by Eagle Scout Charles Crighton, who organized the collection of items as part of his Eagle Scout project. These supplies were delivered to UF/IFAS Extension Miami-Dade County office in Homestead, where Miami-Dade 4-H volunteers, local churches, 4-H families, and other individuals and businesses donated many additional supplies including, another generator, animal feed, hay, tools, food items and other supplies. 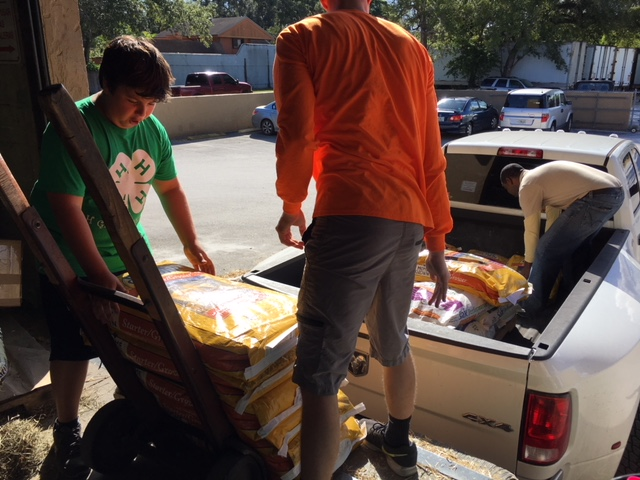 Additionally several animal feeders were built and four large water tanks were donated for the livestock animals raised by 4-H members in Panhandle. But the supplies still needed to get to the Panhandle. Miami-Dade County 4-H volunteers Jessica Davila and her husband Christian Davila, along with their 12-year-old son Anthony and 6-month-old daughter Abbie and the family pet, drove to the Panhandle, purchasing more hay and 12 gallons of extremely needed chainsaw oil on the way, and delivered all donated supplies to 4-H volunteers at Jackson County. The entire trip took 48 hours. Anthony Davila loads animal feed bags at Sunset Feed Supply. “After Hurricane Irma last year, many 4-H volunteers, including some from the Panhandle, traveled to south Florida to help several families, including the Davilas, by helping rebuild the animal enclosures on their properties. So, after Hurricane Michael, Jessica and Christian knew they had to go to the Panhandle and offer the same support,” said Teresa Olczyk, director of UF/IFAS Extension Miami-Dade County. The donation project was a team effort, with UF/IFAS Extension faculty in both Miami-Dade and Palm Beach counties all playing a role.